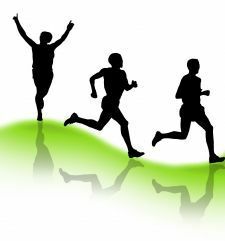 There is a world of difference between running and racing a marathon. 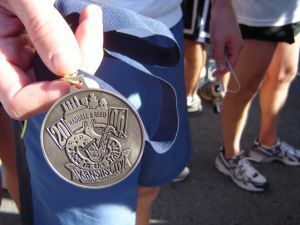 Advanced Marathoning is not about "just" finishing a marathon. Even though that is a major accomplishment. It is about running your best marathon yet. 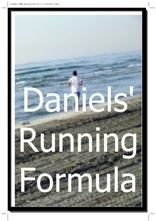 This marathon running book is the perfect book for you if you are aiming for your best marathon. I would argue that this book is a great read for any runner because it covers many sound basic running training principles. Advanced Marathoning is about advanced marathoning. 100 Day Marathon Plan is more inclusive offering plans for slower runners as well. I think both books are great and useful in their own way. It is good to see both perspectives and pick up elements and insights from both books. So, why is Advanced Marathoning an excellent book about racing marathons? The book contains eleven chapters, with chapters eight to eleven being predominantly running programs. The first chapter explains the concept of "advanced marathoning" and describes what the rest of the book is about. The second chapter is a great chapter about marathon running training. It tells you what you need in a marathon, which of your body systems are addressed and how that translates into your required training regime. Very useful are parts titled "When are long runs too long" and "Increasing mileage while minimizing the risks of breakdown" as well as a chart with sample long run paces. Also the concept of periodization is clearly explained as well as how it applies to marathon training. Basically, periodization is cutting your training into blocks, each block being a number of weeks in length, in which you train certain body systems. Nutrition and hydration are the subjects of chapter three of Advanced Marathoning. Pfitzinger and Douglas explain what the critical factors are in a marathoner's diet and what the intake should be of proteins, carbs, iron and fluids. During training as well as on race day. What I especially like about this chapter, in fact about the whole book, is the realism. say "Thou shalt not drink alcohol and caffeine" and leave it like that. Pfitzinger and Douglas don't do that. They take their time to address the issue. And they recognise that the majority of runners do have a daily coffee and an occassional glass of wine, beer or spirits. And they use that to give some recommendations on what to do around race day. The fourth chapter deals with balancing training and recovery. Again the realism and completeness do it for me with items like "When to do back-to-back hard days" and "Recovery considerations in the real world". Chapter five of Advanced Marathoning covers cross-training and which types of cross-training are beneficial to you. Chapter six is about tracking your progress. As a runner it is good to think about the longer term. Pfitzinger and Douglas ask you to state your marathon career goal, goal for your upcoming marathon and about your short term process goals. These goals need to correspond with each other. If you do not put the required training in this week, then you will jeopardize the goal for your next marathon and, further down the line, your marathon career goal. Their message is, set your goals and track your progress. Know why you do what you do. Marathon training is hard work and requires sacrifices. In order for you to not lose your motivation and direction, focus on your short term goals. The seventh chapter covers race day strategy. This is oh, so important. Have your plan ready for race day. Know how you'll prepare yourself, know your goal time and pace yourself accordingly. Going out too fast is the number one mistake for too many marathoners. Every minute too fast in the first miles will cost you at least five minutes at the end. Pfitzinger and Douglas also tell you what to do when you go out too fast or too slow. The main message of this chapter is that you have to be in total control of your plan and be fully aware of what you are doing. When you get to those final six miles your pacing, eating and drinking during the first twenty miles will determine what you look like, how painful the end will be and whether you'll make it to your marathon goal. Give this chapter a lot of attention. Think about it when you are training yourself silly. Marathon training is taxing. Do not make an improperly carried out race the cause of regret and waste of many training hours ! Chapters eight, nine and ten cover a good range of marathon running programs. Depending on what you are after, you can go for a 12-, 18- or 24-week running program for upto 55 miles per week, upto 70 miles per week and more than 70 miles per week. So plenty to choose from and certainly something in there for you. The last chapter covers the area of multiple marathoning. Not really the great ending I want from a book I otherwise fully endorse. I have always written off the idea of multiple marathoning as plain lunacy. It speaks for Pfitzinger and Douglas that they want to be complete and realistic. They know there are people out there who need to, or who want to do more than one marathon within a certain time frame. So the final chapter of Advanced Marathoning has five transition programs in this book depending on the times between marathons (12, 10, 8, 6 or 4 weeks). This book is required reading for you if you are serious about the marathon. It offers helpful advice on all aspects of marathoning.